It's a trip with four hunting days in the area around 50 km southwest of Kangerlussuaq. Our camp is a larger cabin out in the huntingarea, older and primitive, but heated and comfortable. Winter Sleeping bags are included. Transport from Kangerlussuaq to hunting camp is with with snowmobile and/or ATV. The hunt takes place with snowmobile transport to a few km from the animals, and the rest on foot. After the animal is shot, we transport meat and trophy back to camp by snowmobile. You have to be in a moderate condition, so you can walk 3-4 miles of varied terrain with little snow. There will be one hunting guide per two hunters. There may be 6 hunters per event. This included not hunters, wives/girlfriends etc. There cannot be more due to logistics of accommodation and transport. It may be around minus 25 at night and minus 10 to 15 a day, but it varies a lot, so you have to have warm clothes, preferably several thin layers than one thick. The catering is plain food, oatmeal with milk, bread and cold cuts, freeze-dried food for dinner if we are not near the camp, hot food in the evening where we most eat any meat from slaughtered animals, reindeer and musk steaks, tea and coffee. We can enjoy a whiskey or two in the evening, but not during the hunt and not large quantities. Day 2-5, hunting from the camp. You cant not fly home on day 6, you have to book airplane for day 7. You can rent warm clothes and rifle. Hunter will help with all practical work, fix animals, cook, and other camp work. (it's too cold to stand still anyway). After the hunt you stay at Kangerlussuaq Youth Hostel as included in the price. 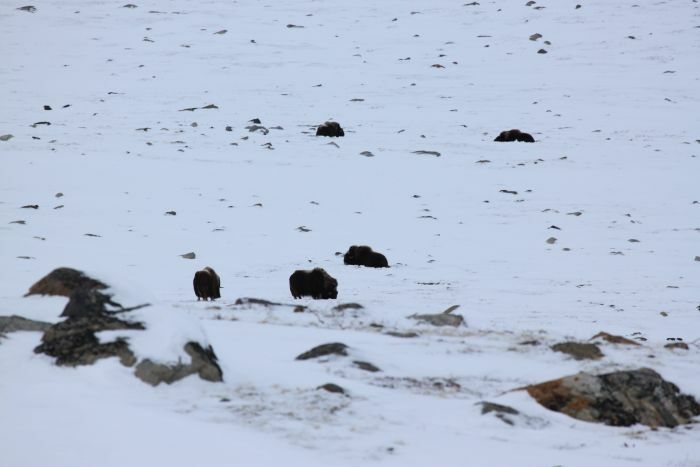 As it is natural for any hunting, even the success rate in the area is 100% for musk-ox for the winter hunt, we cannot guarantee you will get animals. You must be realistic with your expectations, and much depends on you, your fitness and skill with a rifle. That being said, the hunt takes place in a unique area with a very large muskox population, and due to the commercial shooting of young animals, there is a very large portion of the population that is older bulls, and of these, a large proportion medal trophy. During the winter hunt the commercial hunting is over, and therefore there is quiet in the hunting area. Musk ox is fairly easy to trace, and to get within shooting range of, but the reindeer a little more spread out, more alert, and usually goes up in the mountains. So reindeer hunt requires that you can walk longer. You must use the terrain as they easily gets scared by noise or movement. One should also be aware that all major reindeer have thrown the antlers in the winter, so it's not big beautiful trophies you get home. When musk oxen and reindeer are shot, then we use the rest of the hunt for small game hunting, there are foxes, ptharmigans, and quite a few snowhares. And we can go icefishing for fjord cods. It is allowed to bring 5 kg of frozen meat on the plane to Denmark, so its possible to get a little meat from the hunt with you home. If it is frozen and well wrapped, it can keep frozen until you are in Denmark. We always carry additional safety equipment and satellite phone on all trips.